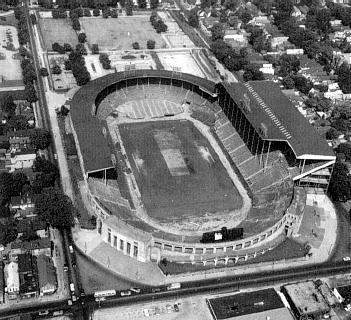 In 1960, Offermann Stadium was closed and demolished to make way for a new public school and the Bisons joined the Bills in newly renamed War Memorial Stadium and it was during the ensuing decade that the Rockpile would experience its hey day. 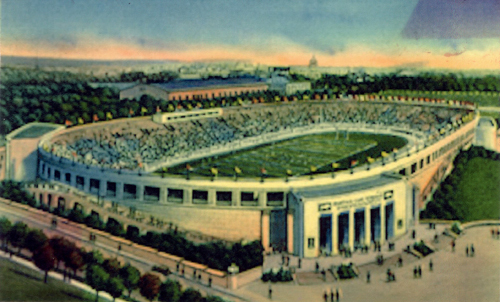 Both the Bisons and the Bills would win championships inside the friendly confines of War Memorial Stadium. The Bills' teams featured such players as fullback Cookie Gilchrist, quarterbacks Jack Kemp and Darryl Lamonica, defensive linemen Tom Sestack and Ron McDole, future hall of famer Billy Shaw, punter Paul Maguire and pro football's first soccer-style kicker Pete Gogolak. The Bisons fielded a future hall of fame too in catcher, Johnny Bench. It all came to end in the early seventies when the Bills moved into there new suburban home, Rich Stadium and the Bisons moved to Winnipeg, Canada. The Rockpile sat unused from 1973 till 1979 when minor league baseball returned and was played there until 1988. On October 15, 1998 Ken Crippen writes: War Memorial Stadium was also called Roesch Memorial Stadium in 1937, then changed to Grover Cleveland Stadium that same year. It was then renamed Civic Stadium from 1937 to 1959. A more exact address is 285 Dodge Street, Jefferson Avenue, Best Street. Other Buffalo Stadiums include Bison Stadium (NFL Buffalo Bisons 1924-1925, 1927, 1929, and the NFL Buffalo Rangers 1926) and Canisius Villa (NFL Buffalo All-Americans 1920-1921) and Buffalo Baseball Park (NFL Buffalo All-Americans 1922-1923). Canisius Villa also hosted the Buffalo All-Americans vs. Toledo Maroons 11/25/23. Buffalo Baseball Park also hosted the Buffalo All-Americans vs. Cleveland Tigers 11/28/20, Buffalo All-Americans vs. Akron Pros 12/5/20. 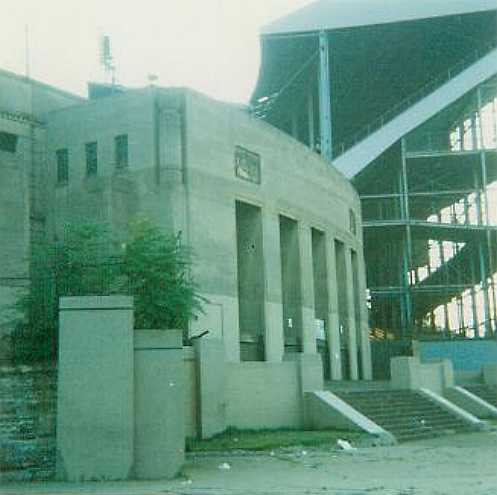 On 23 June 1996 Paul G. Kistner writes: Before Rich Stadium was built to serve as the home of the Bills from 1973 to present, they started in War Memorial Stadium from 1960 to 1972. It was built in the 1930's on Jefferson and Best streets downtown. As most everyone referred to it as "the rockpile," it was also used by Buffalo's Triple A Bisons Baseball Team and by the old All-America Football Conference Team in the 1940's. Ground breaking ceremonies were conducted in Orchard Park for Rich Stadium on April 4th 1972. The first shovel of dirt was turned by Erie County Legislature Chairman Richard Keane and Bills owner Ralph Wilson. The final pro football game played at War Memorial Stadium was on Sunday, December 10, 1972. Bills 21 / Lions 21. On 15 October 1997 Terry Sheehan writes: Love your web site on old stadiums. As a native of Buffalo, NY, I noticed your War Memorial Stadium picture appears to be from 1938. Given that first the Bisons then Bills of the old All America Football League, then the Bills of the American Football League played there, would it be possible to post picture(s) when the roof, seating addition, lights etc. were put on. The 'Old Rockpile' as us natives used to call it went through several renovations through the years, which greatly altered its appearance. On the Buffalo History Works Photo page is a pic from what appears to be 1984 around the time of the filming of the movie "The Natural" (which I was an extra in!). It gives a flavor for how different it became over time, and my memories of the place a vivid. Although you've done great work in the other football sites, I was a little disappointed that some of the old AFL stadiums were not provided (e.g. Balboa, Jeppesen, KC, Braves aka Nickerson Field, Stadium in Cincy). Are they hard to find? The story given about Yoeull Stadium in Oakland was great, however. More pics and stories like that would be greatly appreciated. Do you know of an American Football League web site...that league was a great story and was documented on HBO. Otherwise, keep up the good work. On September 19, 2000 George Poole wrote: War memorial Stadium also hosted the Stock car races in the early days of NASCAR. I spent many days there watching the stock car races. The racing oval was around the perimeter of the stadium.